Amazon's next Alexa speaker to have touchscreen and better speakers | What Hi-Fi? 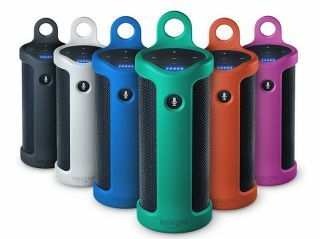 Similar to the Amazon Echo, this speaker will reportedly feature a touchscreen display and better-quality speakers. Amazon is planning a premium version of its voice controlled speakers - the Echo and the Dot - which will come with a big, touchscreen display, according to reports. Bloomberg quotes "two people familiar with the matter" who claim the new speaker will have a 7-inch screen, in order to make it easier for users to access weather forecasts, calendar appointments and news. The speaker will be larger, and the screen will tilt upwards so that it can be viewed on a counter. It will also reportedly have better speakers to make the premium Echo sound better than its existing counterparts. These speakers are apparently being added with a focus on high-quality audio at all volume levels, with at least one prototype version of the device placing speakers below and behind the screen. One of our criticisms of the Echo was its "so-so sound"
The new device will run a version of Amazon's Fire operating system, similar to that on its tablets such as the Fire HD 8. According to sources, Amazon is testing features that allow users to "pin items such as photos on their speaker’s screen akin to physically placing items on a refrigerator door". Amazon is looking to fend-off competition from other AI speakers, such as Google's new Home speaker, which has similar functionalities to the Echo. This new Amazon AI speaker is apparently scheduled to be announced in the first quarter of 2017, although Amazon are yet to officially release details.